For as long as I can remember, India has been a place I've wanted to experience firsthand. In 2017, I finally made a trip to Kashmir to climb in the Suru Valley of the Zanskar Range. Our expedition research began by looking through the list of peaks that the Indian Mountaineering Foundation (IMF) opened in 2009. I was searching for peaks that were aesthetic, had big technical features, and no record of exploration—to our knowledge we are the first people to travel on the glaciers we encountered. My longtime climbing partner Tino Villanueva and I decided the north aspect of Rungofarka (6495m) was worthy of an expedition. 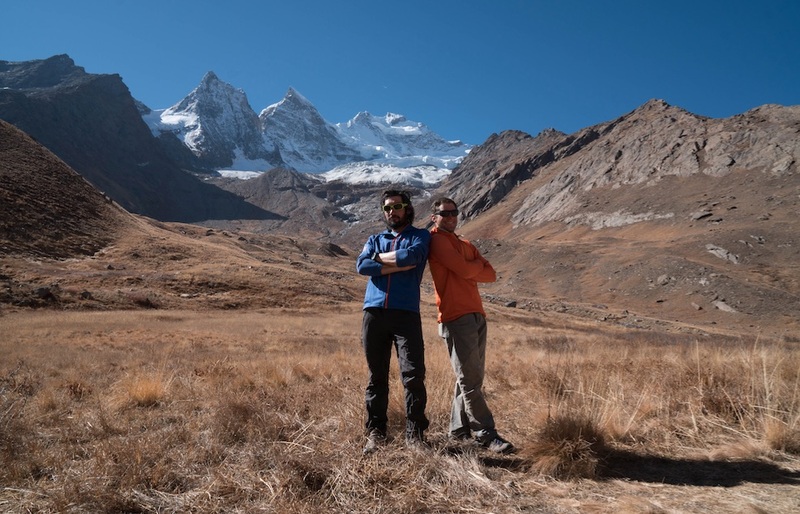 After Tino and I wrapped up our summer guiding seasons in Chamonix we took off for India on September 6. Getting to the north side of Rungofarka involves a domestic flight from Delhi to Leh, followed by two days of driving on roads of varying quality into the Suru Valley. There, we met horsemen who brought ponies to establish our base camp. Everything was going well until we hit a talus field half a mile from our planned camp. The horses couldn't cross, leaving Tino and me to shuttle loads the final half-mile. After a bit of bargaining, a few of the horsemen helped carry loads, and we had all necessary supplies in an idyllic grassy base camp at 3900 meters before sunset. We spent the following days acclimatizing and establishing our advanced base camp at 4900 meters. After scouting our glacier approach and enjoying some good bouldering sessions, we decided to attempt Rungofarka's north face. Halfway into our trip, during a short high-pressure system, we moved from our base camp (3900m) to the bergschrund (5300m) for the night. 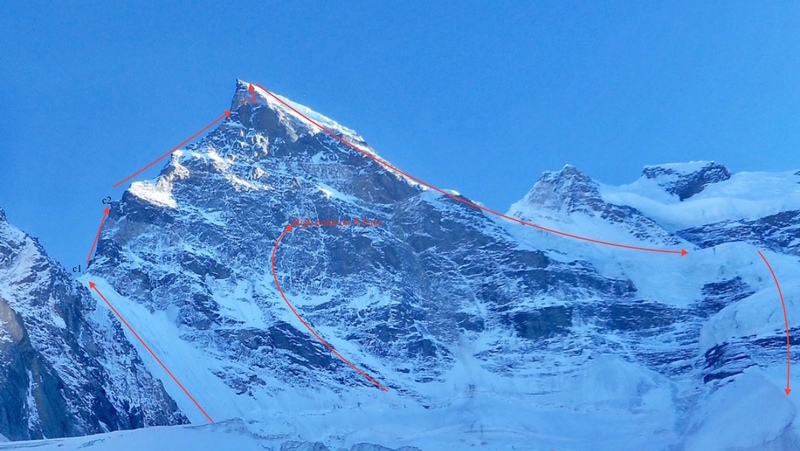 The next day, we attempted our intended line, which proved steeper and more difficult (AI5+ M5) than we anticipated. Eventually darkness engulfed us. With worn-out calf muscles and no ledge in sight, we called off the attempt. 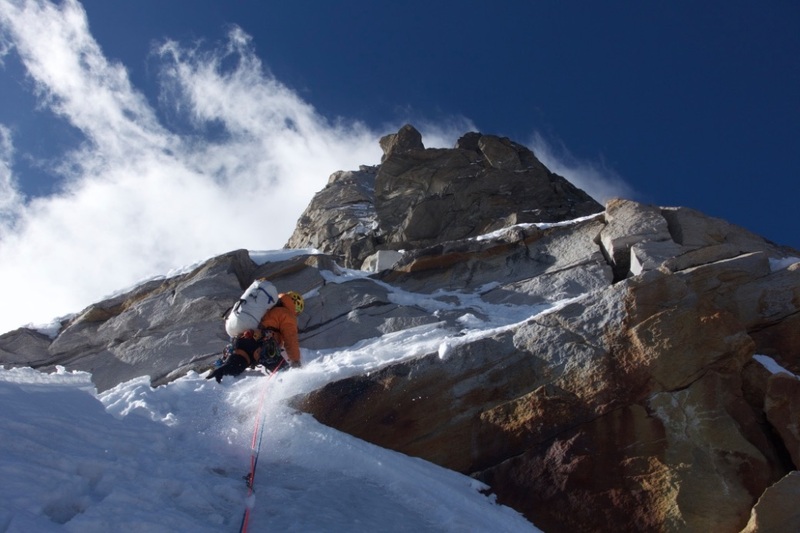 We rappelled through the night back to the "shrund bivy," and reached base camp the following day (September 26). After our attempt on the north face, we felt as if we needed hammocks. The terrain was too sustained and down-sloping for the small single-wall tent and two-person sleeping bag we had brought, so we decided to set our sights on the north ridge for the next try. A huge high pressure system arrived after a few days of rest. 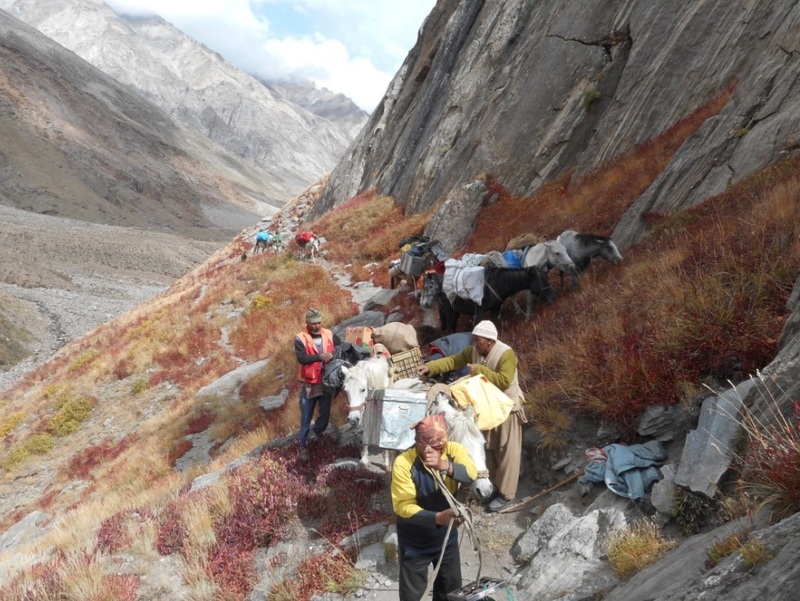 It was perfect timing because porters were scheduled to arrive back in our base camp just six days later. On September 30, Tino and I packed up and headed to our ABC (4900m) for the night. Walking across the glacier the next morning I was feeling awful, nauseated, with general malaise, and I thought, "Why am I trying this thing again?" 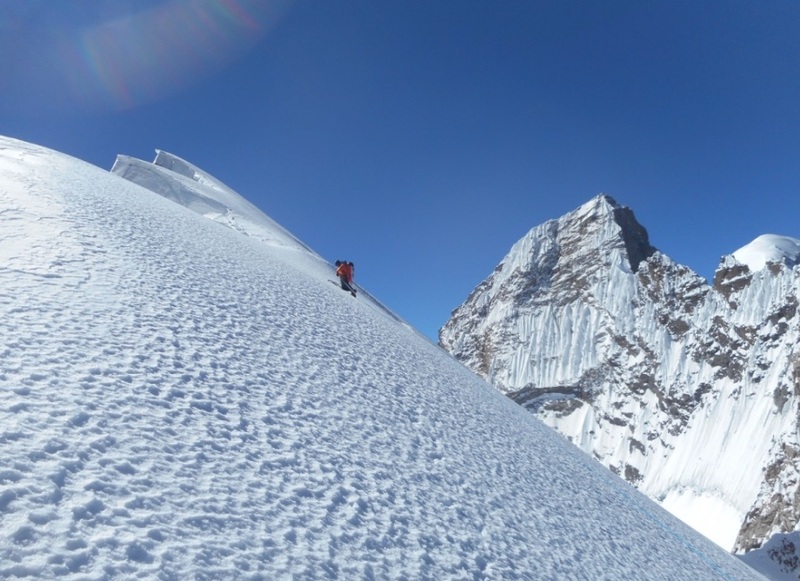 I was thankful that these feelings faded as we crossed the 'shrund and we climbed nine rope lengths of AI3 to a prominent col where we could access the north ridge. Although the col was narrow, we quickly stomped a platform out and had a restful first night on route (5700m). While our bodies rested, our minds raced. 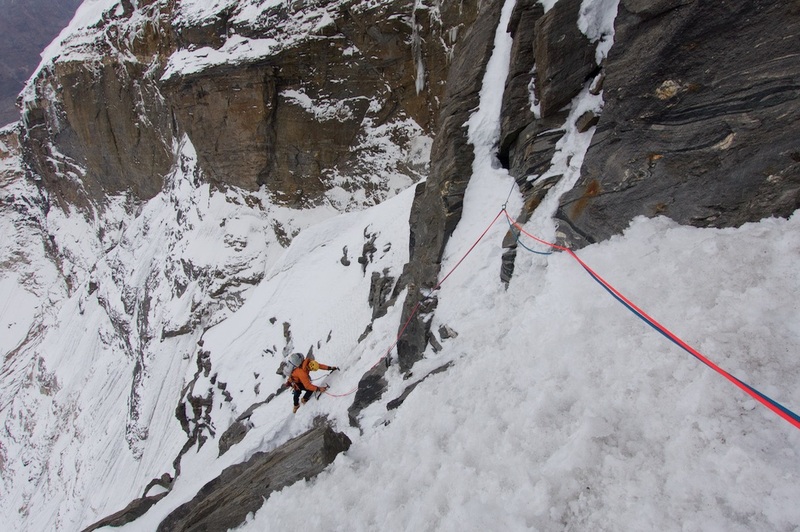 The next morning, we would have to negotiate 200 to 300 meters of near-vertical mixed terrain. From our photos this appeared to be the most sustained and driest portion of the route. 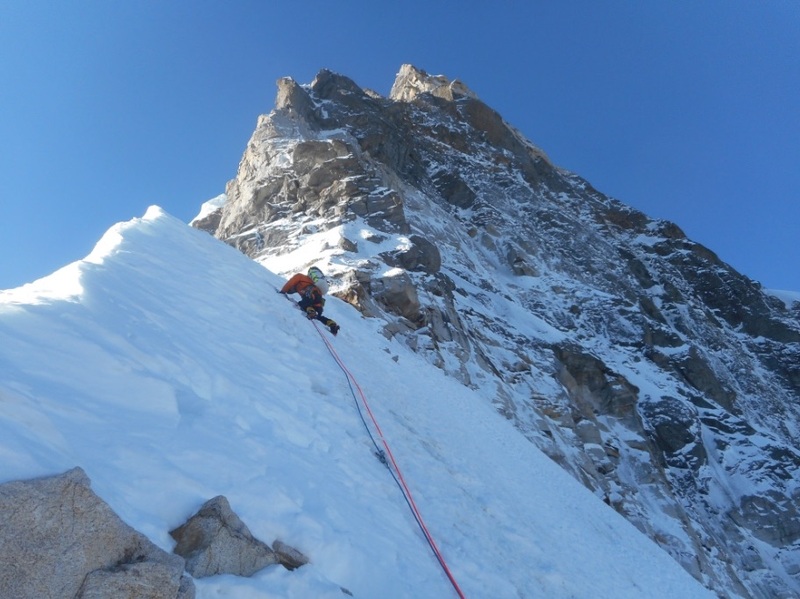 On October 2 the climbing was slow, thought-provoking, at times loose, and mostly in the M5/6 range. We had some incredible pitches, along with some horrific ones, and at the end of the day, we were 10 pitches higher, at a glacier cave bivy (5950m). The cave had a flat floor, big enough for the tent, and an opening so narrow we needed to take off packs to get in and out. Although we made a modest elevation gain that day, we had gotten through a huge section of uncertainty, and were beyond excited to have the opportunity to battle another day. The next morning (October 3) was a mental challenge. That day we had a lot of terrain to cover—we needed to move—but we also needed to think realistically about turn-around times if we found ourselves climbing slowly. Fortunately the difficulties were mostly in the M4 range to start. 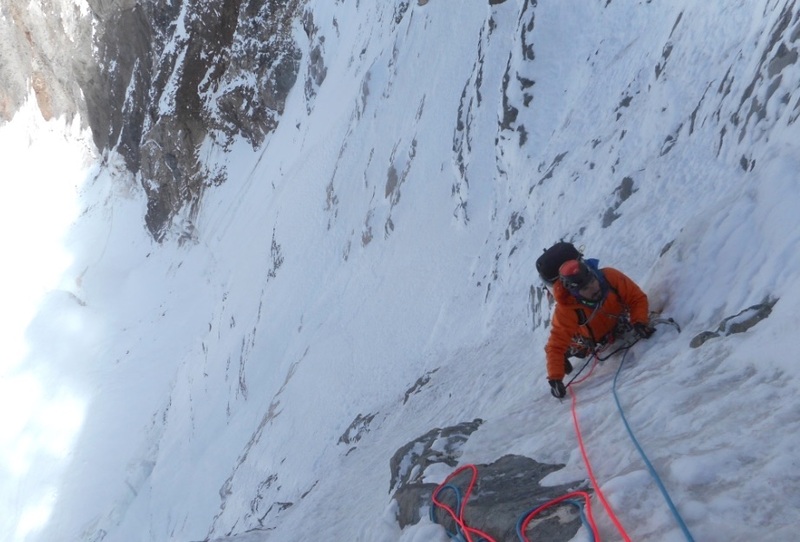 The first handful of pitches eased away, along with some of the mental weight, before the ridge steepened with some more M6 cruxes. Higher up, two pitches slabbed out, and we had to make tension traverses off knifeblade pitons to transfer from the slab into ice runnels. One pitch below our high bivy (6200m) we faced an unavoidable, 6-inch wide vertical offwidth crack. We had seen it looming above, guarding our planned bivy for hours as we got closer to it. Climbing it involved some serious runouts between pitons in horizontals because our largest gear was a 3-inch cam that was used for the belay anchor. It was the nineteenth pitch of that day and was likely the mental crux of our route. The high bivy, or "prow bivy" as we dubbed it because it was perched on top of a feature resembling the prow on Mt. Hunter's Moonflower Buttress—was less than ideal. After two hours of chopping into a snow arete in the dark, with winds gusting 40 to 50 mph we created a ledge about three-quarters of the width of our tent. We spent the night bracing the tent from the wind, and sharing the uphill side of our ever-shrinking tent platform, as the snow was difficult to compact, so any movement caused our tent platform to deteriorate on the downhill side. We woke to clear skies and calm winds. Our next obstacle required rappelling off the prow to reach the next ice runnel, which was the only clean exit off the upper north face. Committing to the rappel was a serious moment for us. We couldn't see into the heart of the lower portion of the runnel. We didn't know if it was iced or if there was a crack system. All we knew was if we could make it through the 50 feet of unknown terrain we would have one pitch of WI3 to get off the face. There was a lot of deep breathing as the ropes were pulled. The next pitch proved to be one of the most challenging of the route. Thin, delaminated ice, and powerful M6 moves linked one iced seam to the next—a hell of a sting-in-the-tail exit. 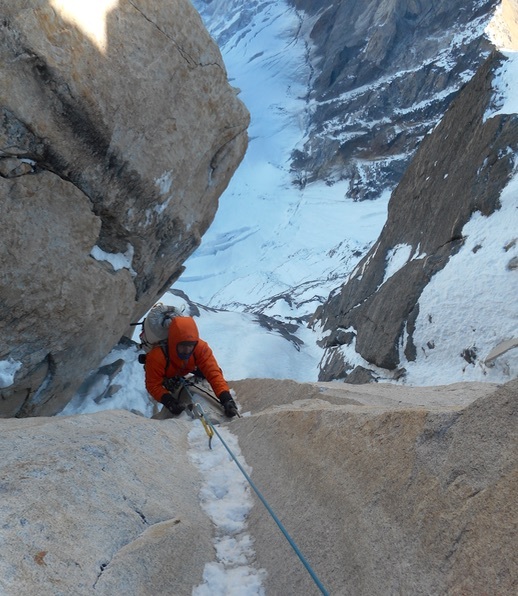 I felt that clipping into the anchor on the top of that pitch was more of a highlight than standing on the summit, because at that point we knew we had solved the puzzle. 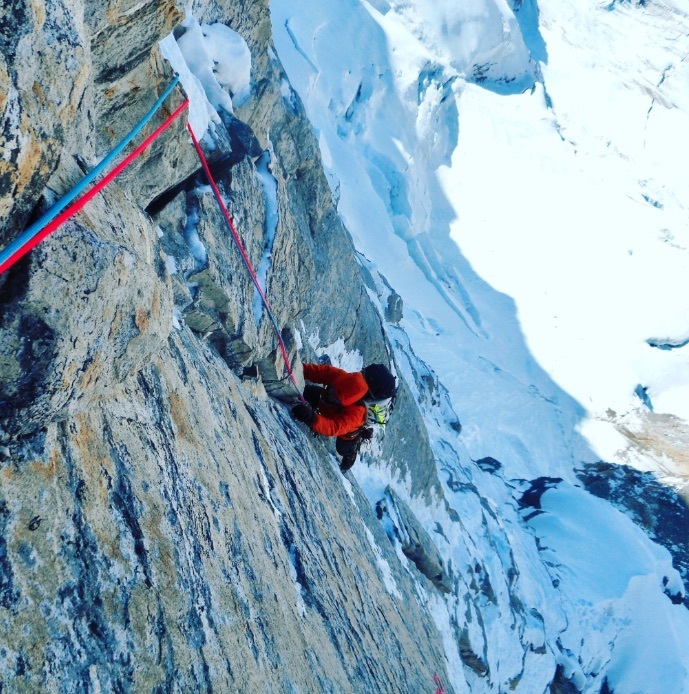 At the top of the north face headwall, we put one cord away and transitioned to simulclimbing for several rope lengths up the 60-degree summit icefield until we both had to clip into screws and shake our legs out. The angle eased and a couple hundred meters on neve led us to the summit. After a short stay and obligatory photos, we began our complicated descent down the west face. This involved around 20 rappels through areas of high objective hazard coupled with breaking trail through unsupported snow crusts. We trudged on with continual movement and made it back to base camp that night, descending 2,700 vertical meters in around nine hours, and arriving in BC just 12 hours before our porters! Our route, The North Ridge of Rungofarka (The T&A Show) VI M6 WI4+ (ca. 50 pitches, 1200m vertical technical terrain) was established from September 30-October 4, 2017. Thanks to the Mugs Stump Award and The Copp-Dash Inspire Award for making this adventure possible.